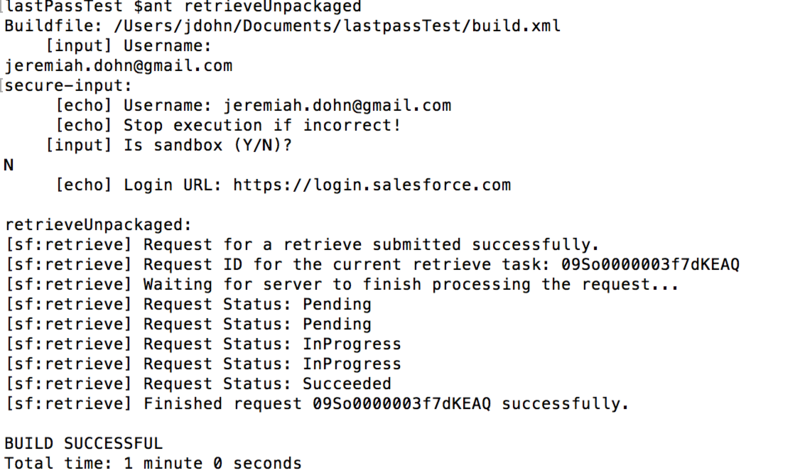 For developers, we all know that it is not very good to keep our passwords, usernames, and security tokens in a plain text file, yet the sample provided by Salesforce in the force.com migration tool does this. I was looking for a better way. I have a few but ultimately, my goal is to type in a string for my developer environment and have authentication be handled for me. This post is geared towards both mac and pc. You must install ant contrib for this example to work. You have to type in your password + security token, username and specify if it is a sandbox each push / retrieve. This gets old fast. Not preferred but a good example if you don’t want to do too much setup. Install ant-contrib. I won’t give step-by-step instructions for this. The ant-contrib documentation has this clearly spelled out here. You don’t need to remember your username, the endpoint or the security token. You type in the value of your lastPass environment and the rest is done for you. You don’t need ant-contrib for your build.xml. Using a password manager that has strong encryption and security standards means that your platform is more protected – much more so than if you have your password in a plain text file. This requires lastpass but there are plenty of other password managers that have CLI integration to use. I just happen to use this one. I chose lastpass because it has cli support, works on any device, and also supports two factor authentication, either via google authenticator or SF authenticator. The setup is a bit more intensive, but pays dividends in the time it takes to enter your password, enter your security token, enter the endpoint, & repeat. If you don’t have a lastpass account, you’ll need to get one. You can get one for free from here. Install lastpass for cli from the github repository. The installation instructions are very clear on the github repo. If you want the full documentation on usage of the CLI, it is available here. Go to your last pass account and create a new site, storing your security token in the notes field. Type lpass login [username]. You will be prompted for your master password and if you have two factor enabled, you will be prompted for this as well. We will need to create a simple script to populate the environment variables for usage to pass into ant. I highly recommend keeping these in your folder with you ant scripts. You can put both the windows and mac version in there if you are one of those lucky individuals like me that uses both operating systems. Before getting started, if you’re on windows 10, you will need to enable the linux bash for windows. This is included in their anniversary upgrade. How to enable is here. You will use the ubuntu installation instructions from the github directory. If you’re on a version less than windows 10, you will need to use cygwin. Put the script from the mac section below in your directory and execution will be the same, except you will use bash instead of sh. Where script is your script. Save the below as “loadvars.sh”. ant "$antTar" -Dsf.username="$username" -Dsf.password="$pass" -Dsf.serverurl="$serverurl"
Alternatively, you can use -u and -a as shorthand for the uid and the ant target. If all works, your screen should look like this. Both scripts will present you with the command, the username and the endpoint. You must confirm before proceeding. This is for your safety. It is always good to confirm that you are deploying to the right environment, no? If you wanted to, you could add a force command for CI build scripts to bypass the prompt. ← What user permissions are dependent upon each other?